You take young Rover to the dog park for the first time to let them interact with other dogs. Unfortunately for you, Rover doesn’t seem to enjoy being around some of the other dogs- and on top of that, he takes a few snaps at some of them. Not everyone in this world gets along- and the same thing goes for dogs as well. Aggressive reactions to dogs and other animals can be a big turnoff when you want to go out and play at a park or with fellow pup owners. Owners may not even be aware of aggressive conditions especially if your pup has been rescued from a shelter. There are various levels of aggression that a pup can experience; snapping, growling or right out attacking and going for the jugular. This can be a difficult situation to cope with as your pup is embedded with the need to protect themselves before they are even attacked. Allowing your pup to play with unknown dogs that may also have aggressive qualities can be dangerous. A pup suffering from attacks and beatings can be traumatized- often resulting in their own aggressive tendencies. As your pup’s owner- you need to understand that you are part of their pack (or they are part of yours, whichever you prefer). You play the part of mentor, leader and parent for them. You teach and protect your pup from the dangers of the world. Letting your pup fight for themselves in order to toughen them up can have repercussive effects and simply result in developing aggression- and often will make it less likely that they will pay attention to you. When you go to dog parks or you introduce your pup to others, make sure that you intervene in any fight or signs of aggression. You will want to teach your pup that you are their protector and master to help prevent them from developing aggression to others. You may feel that this makes your pup weak as it seems that your pup can’t protect themselves, but by nature a dog knows when there is true danger and will protect you when it is necessary. What about other dogs? You never ever trust your pup with a strange dog when they are alone. 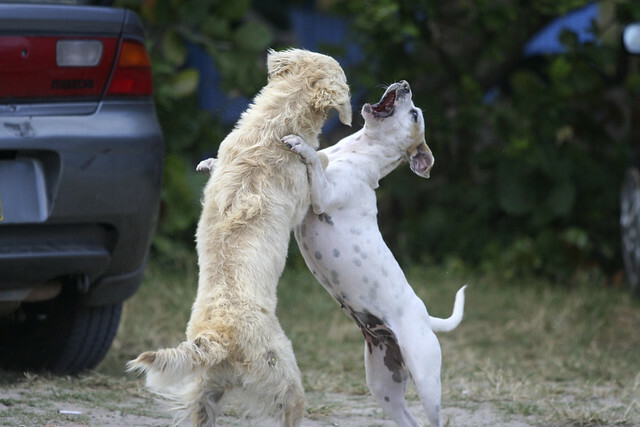 Aside from worms and ticks, another dog can have aggressive tendencies. Leaving your pup to play solo at a park with other pups can be extremely dangerous. In larger numbers, dogs regain their pack instincts and will attack- especially a newcomer to the group. This is known as “rank-drive” and is natural instinct for dogs. Sometimes it occurs without a fight, but it often results in aggression. Either way you don’t want to chance your pup to strangers. They may seem playful at first, but it only takes a second for another dog to attack- and injure your pup. Obedience is the key to keeping your pup’s aggressive tendencies docile. You need to establish yourself as the pack leader for your pup. Create a situation in which your pup looks to you for guidance through proper training. If your pup’s problems are extreme, you may need to consider an actual obedience school for them. But as long as you teach your pup from the get-go that you are number one, they will respond well to you, and hopefully stay out of trouble on the playground.